Published Oct. 10, 2018 at 4:01 p.m.
Metallica is back on the road, bringing a brand new stage design to Milwaukee's brand new Fiserv Forum for its 2018-19 WorldWired tour. 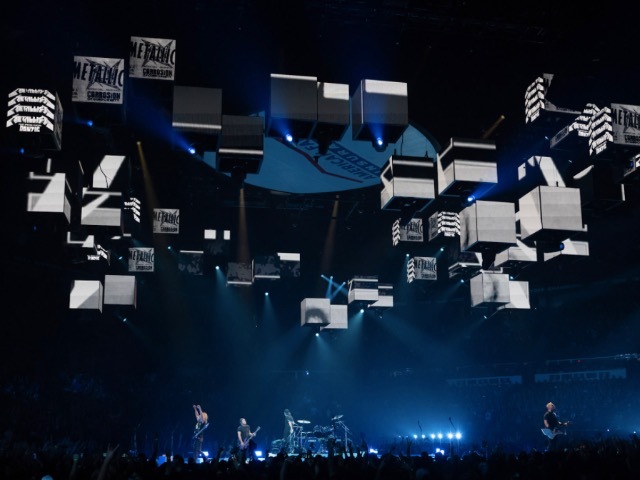 The stage design for Metallica's new show incorporates a dazzling array of cubes that are constantly evolving with color and design in time to the music. Even by Metallica's standards, the current tour's visual appeal tops anything the band has ever done. And best of all, the show's look was designed and created by former Milwaukeean Dan Braun, who has worked with Metallica since 1994. After Braun graduated from Hamilton High School in the mid-'70s, he got a job working at The Palms nightclub on 26th and State. A former motion picture theater from the 1920s, The Palms became one of the city's preeminent rock stages where the Ramones, Rick Derringer, Johnny Winter, Joan Jett and countless other bands played. The Palms was also the place where Plasmatics lead singer Wendy O. Williams was roughed up by the police before being arrested for her lewd stage antics. Braun was in the middle of it, setting up chairs, rigging lights, fine-tuning the sound system and doing, as he puts it, "whatever needed to be done." It was through The Palms that Braun got to know Pat McCurdy, frontman for the local band Yipes. McCurdy had just gotten a record deal with RCA, which wanted to send the band on a national tour. Braun became Yipes' road manager, which on a small tour's tight budget meant he was also the lighting director, box office manager and, you guessed it, any other position that needed to be filled. When Yipes failed to connect on a national level, RCA dropped the band, and its members went their separate ways. Braun, however, took an offer to join Randy McElrath's StarDate Productions in 1980 and stayed for the next 10 years. He also worked for Summerfest booker Bob Babisch doing production at the side stages before being promoted to overseeing the entire festival's music operation. In 1990, Braun went back on the road, this time with the heavy metal/pop band Poison. Two years later, he began working with Robert Palmer, Tesla, Bruce Hornsby, Queensryche, Madonna, the NFL and, of course, Metallica. OnMilwaukee got a chance to chat with the stage design specialist about how he became a stage design specialist. OnMilwaukee: Is it even possible to plan for a career like the one you've had? Dan Braun: Speaking for myself, I'd have to say no, because I was never looking that far ahead. I was always living in the moment and learning everything I could from the people around me. Somehow, I always knew when it was time to move on to whatever was next. Still, there must have been something that made you want to work at The Palms after high school. When was 9 years old, I was crazy about Bart Starr and the Green Bay Packers. A major sporting event has elements of great theater, and I was drawn to the presentation. Later on, I started going to every concert I could afford – jazz, folk, rock and roll – because I loved that moment when the house lights went down and the performers took the stage. It was always a magical moment. I may have even snuck into a bar to see a band for a minute or two before I turned 18. Like Cheap Trick at Hanna's on Locust Street? (Laughs) Exactly! At the same time I was enjoying all these shows, I was reading Vince Lombardi's philosophy on teamwork and the meaning of winning and losing. Jerry Kramer's book, "Instant Replay," was a great place to get that stuff. I think Lombardi's quote about giving anything less than your best is cheating stuck with me more than anything else. I bought into it all. If you want to blame anyone for my career choice, pin it on Pink Floyd. Their 1975 show at the stadium was amazing. I've never forgotten it. Your recollections of working at The Palms make it seem as if you treated the experience like being in school. That's a good way to put it. I was a grunt, a go-fer, but it didn't seem that way. This was a time when clubs like The Palms were in their heyday, and I was helping bands like The Police, and the Boomtown Rats, and the Ramones, and Dire Straits get their equipment and instruments through the door and onto the stage that was ready for them to play on. It was around then that I became acutely aware that in the music business you're working for two bosses: The back door boss was the artist, and the front door boss was the paying customers. I don't know exactly what my job title was. I just knew I was part of a team responsible for making the artist happy and making the audience happy. The knowledge you gained obviously made you a great person to hire for StarDate. Yeah, I think so. Randy (McElrath) was a very astute businessman, and he knew I had some skills. I was there for 10 years with ever-increasing responsibility. StarDate wasn't just a Milwaukee promoter. We were putting on concerts in nine states. I was doing stage production, accounting, night of show box office, all kinds of things that taught me about showmanship and how to negotiate with the talent. (Laughs) Every summer Randy let me go and work at Summerfest, too. He might have had mixed feeling about that, but as I said, he was a great businessman and I think he knew I was learning things that would benefit him in the long run. A lot of people would kill for a job like that. Why would you leave? A couple reasons. The music scene in Milwaukee had changed, and I found myself wanting to be out of town. Also, I felt I had done everything I could with StarDate and Summerfest, and found myself thinking about the next logical step. From 1990 to 1999, I was on the road with a bunch of bands and I didn't come back to town until the Bradley Center made me a offer to become Director of Event Services. I was in charge of the entire back-of-house operation until 2002. I left that job because I finally knew I wanted to design stages. I enjoyed the challenge to taking an artist's vision and turning it into reality. How do I make this happen? Where's the magic? That's what I was concentrating on. I know I'm skipping over a lot of stuff, but let's get to Metallica. You'd been working with them for 25 years and then they ask to design something spectacular for the WorldWired tour. This band hasn't stopped touring in 30 years, and they sell albums like crazy. When they announced WorldWired, they wanted to take the live shows to a whole new level. I did some sketches and showed to Lars (Ulrich) and he was very excited. He made me promise not to show them to anybody until he could get the rest of the band to see them. James Hetfield said, "Go for it." How do you take something like that from the drawing board to reality? My path to success has always been team work. There is no "I" in this business. There can't be, because there are multiple disciplines that have to come together to realize the dream. "I" didn't build anything for Metallica; "we" did. It all starts with the band's vision. Without their input, you have nothing. You've been in the entertainment business for 40 years. Any regrets? This interview. I'm much more comfortable pointing a spotlight at someone than standing in it myself! Metallica will perform at Fiserv Forum on Tuesday, Oct. 16. For information on tickets, visit Fiserv Forum's website.